Accellerated boot procedure: Independently from the usual SysV bootscripts, multiple tasks of system initialization are run in parallel, so that interactive desktops are reached very fast. Amount of installed software has been greatly reduced in the CD-version, so that custom remasters based on CD are possible again. On the DVD edition, KDE4 and Gnome with many applications originating from these popular desktops are available. Network configuration is being handled by NetworkManager with nm-applet in graphics mode, and textual GUIs in textmode (compatible to Debians /etc/network/interfaces specification). A persistent image for saving personal settings and additionally installed programs, KNOPPIX/knoppix-data.img, is supported on the boot device, optionally encrypted with AES/256bit. In general, installation as live system on flash disk is recommended. Version 6.7.1 has been updated from Debian/squeeze with the usual picks from Debian "testing" and "unstable", and uses Kernel 3.0.4 and xorg 7.6 (core 1.11) for supporting currentmost computer hardware. New boot option (example) "bootfrom=/dev/sda1/knoppix-test.iso", for mounting the Knoppix compressed file system from a stored iso file directly. ADRIANE: Updated to version 1.4 of the non-visual desktop framework, now using cuneiform as engine for text recognition of scanned texts, enhanced support for several cellphone models via gammu (SMS function). (new in DVD version) eViacam, a program for controlling the mouse by moving your head, using the webcam. Workaround: Modified boot process for starting in Virtualbox without delay. Bugfixes: Repaired "Install additional software" menu (flash, Fonts etc. ), Virtualbox Kernel module, braille devices in orca, keyboard navigation in ADRIANE. CD / DVD / USB Versions - which files do I need? 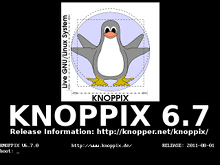 The current public beta release of KNOPPIX 6.7.1 CD and DVD is available in different variants for download at the Knoppix-Mirrors. For burning a CD or DVD, only one single .iso file matching your language and version choice, is sufficient. 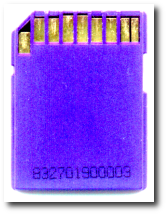 Additionally, several independent vendors offer readily burned and verified CDs, DVDs and USB-memorysticks saent out via postal service. 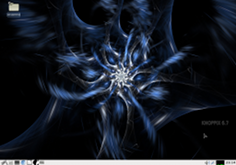 KNOPPIX 6.7.1 / ADRIANE 1.4 beta is available for download from the usual KNOPPIX mirror sites.